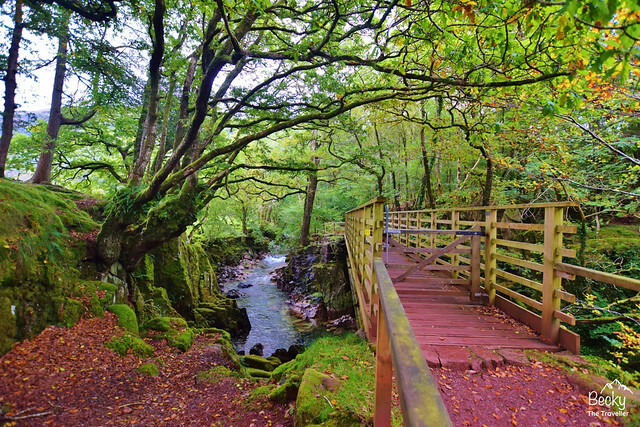 Looking for some walks to do in and around Eskdale in the Lake District? 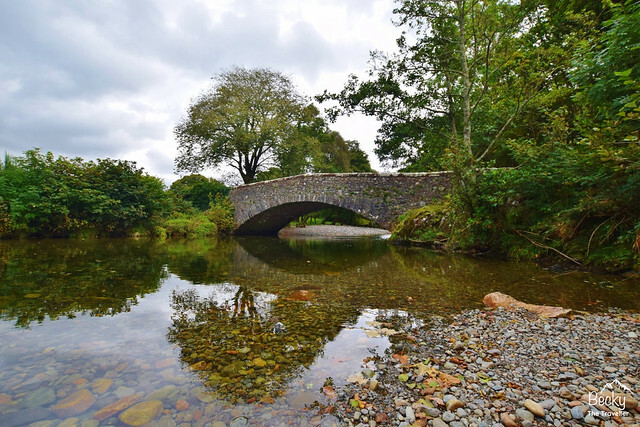 This Eskdale walk to nearby Ravenglass also has the bonus of a ride on a steam train. It’s a win-win, enjoy a beautiful walk from Eskdale then you can catch the train back to the station at Dalegarth Eskdale. After hiking to the top of Scafell Pike the day before I was looking for an easier walk to do in the Lake District. At Eskdale Campsite in Boot where I had been staying in a cool camping pod, I chatted with the owner Martyn about the best Eskdale walks in the area. As soon as he told me about the Eskdale to Ravenglass walk I couldn’t resist it. A 7-mile hike, fairly easy terrain and a bonus ride back on the steam train sounded like a great walk. Here’s a detailed description of my walk from Eskdale campsite to Ravenglass train station. 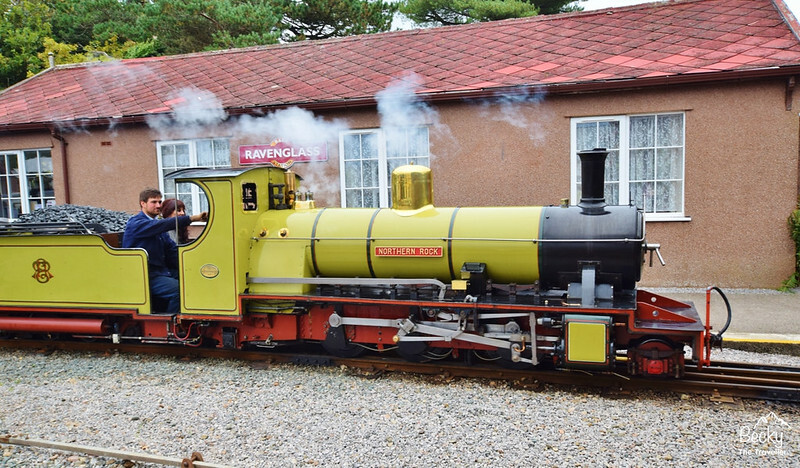 Also included is information about Ravenglass to Eskdale steam railway, which I caught back. 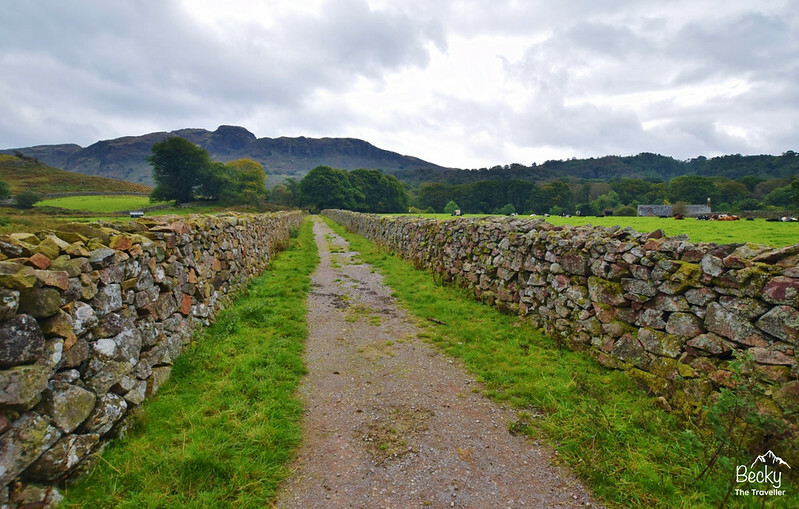 Start of the Eskdale walk – pretty good path! Starting out from Eskdale Campsite my home in a camping pod for the last two nights. You turn right out of the campsite on to the road. After about 100 m turn left onto a footpath at Brook House Inn. This is signposted to St Catherine’s church. Read about my camping pod experience at Eskdale Campsite here. Keep walking past the church house on your right. Then go through a gate on your left signposted Gill Force and Girder Bridge 400 yds. Turn left and follow the path with the river on your right. Cross a tiny narrow wooden bridge. Keeping straight and following the sign for Dalegarth Station 1/2 mile (this is where you catch the train back to). There’s a small pond on your right, go through the gate and keep straight, signposted ‘Forge Bridge 1 mile’. Follow the path around as curves to left. You’ll now see the official signs for the Esk trail (also known as the Eskdale Trail). 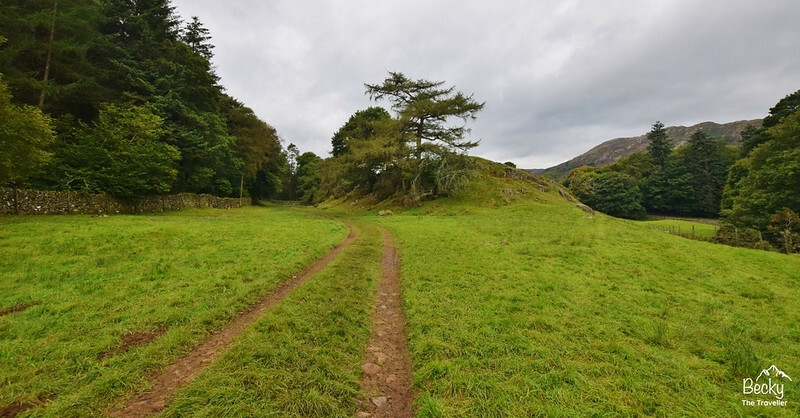 If you prefer a shorter walk from Eskdale (approx 3 miles) this area is perfect for a circular loop through the woods and back round to Eskdale Campsite. After about 10 minutes the path forks off to left but keep to trail straight on through Low Woods. There’s a cute mossy stone wall as you follow the path through the woods. Once you are out of the woods the river comes into view on your right. Keep straight at the farm. Following the river as it twists and turns on your right. After another 5 minutes walking there’s a beautiful stone bridge called Forge Bridge. Make sure you stop for a quick photo of course! Now turn left on to walk on the road. Time: 11.45 turn off road-13.00. This is the longest section of the walk from Eskdale in the Lake District, but also the most straightforward! After 200 m turn off the road onto a footpath. Keep walking for about 1 km, past a bridleway path on right. At High Eskholme, first, keep straight then turn right walking up the gravel path, (pictured above) and follow the path uphill for about 15-20 minutes. (This is the only uphill section on the whole walk). Walk until you go through a gate signposted Eskdale trail. After 5 minutes you turn left on to a wider track (which thankfully is now downhill). On a clear day, you can see right out to the Irish Sea, which is a welcome view. Listen out for grouse scurrying around in the bushes too! Now the final part of the walk and the easier bit. Turn left on to the road (not literally there is a path!) Continue for about 10 minutes until you see a sign posted for the Ravenglass station 1/2 mile onto a minor road. Then on the corner by Camping and Caravan club. Take the narrow footpath on the bend in the road. 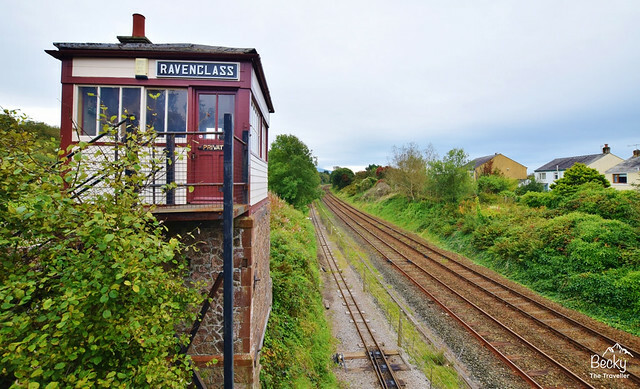 Then turn left after 50 m by play park and you’ll see the beautiful Ravenglass train station appear. The perfect way to end your walk from Eskdale haha! It really is a very quaint train station so be sure to plan enough time before your train. Or you can even spend longer exploring the town as Ravenglass is the only town in the Lake District on the coast! I arrived at the train station at 13.20, half an hour before my train. So plenty of time to buy my ticket, take some photos and watch the train arrive and turn, using the turning circle, which is pretty cool. If you have no idea what I’m talking about then go I promise you won’t be disappointed. In order to get the best experience make sure you check the train timetable before your walk. Why? 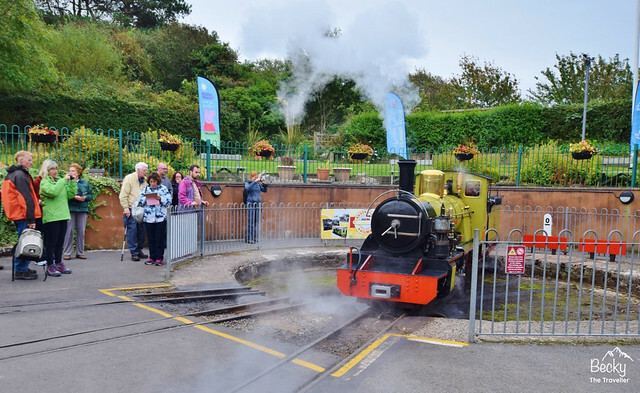 Because some of the trains are pulled by diesel engines instead of the steam ones so to get the full experience you really should opt for the steam train. Allow extra time. Firstly, I allowed just under 4 hours for my hike, which for a straightforward route is plenty of time. However, I did not factor in (going the wrong way – which I did at the beginning) and also stopping for snacks and water on route. The walk was beautiful but I did spend the entire time looking at my watch to check progress. It was like a race the train competition. Although the stupid thing is there was another train an hour later (and one an hour after that). I think my competitive streak took over haha. Take some light snacks and drinks on your walk. There were no shops on the route. Look out for birds and wildlife, you might even see buzzards in the sky, I spotted two on my walk. Are you planning a trip to the Lake District or staying at Eskdale Campsite in Boot? 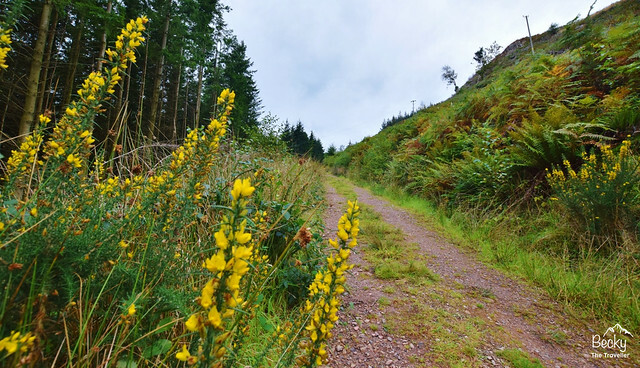 Ask me any questions about Eskdale Walks in the comments below or send me a message. Lovely pictures! I’m sure it’s a great hiking trail.